Last night I attended the talk by Max Rameau of Miami Take Back the Land at the City University of New York Graduate Center. Max has been conferring with Picture the Homeless, a Harlem based group, which is in turn in league with the academic unit Center for the Study of Place, Culture and Politics whose director, Neil Smith was also there. His colleague Peter Marcuse of the Columbia University planning department also spoke, as did two veteran New York City squatter activists. Max Rameau’s position is by now well known in activist circles. (You can see him talk on the City from Below website.) His group founded the Umoja Village shantytown, taking over city-owned land in the black Liberty City neighborhood of Miami that had been intended for sale to a private developer. Not surprisingly in view of the tumultuous past of the district, the city kept hands off. Take Back has now taken over another tract of land to grow fresh food in a community garden. After Max, Brenda Stokely spoke. She had participated in a squatting campaign – then called homesteading – in Harlem during the 1980s. She reminded the audience that the state moved against their organization under criminal enterprise statutes (RICO), although the grand jury refused to indict. Neil Smith spoke of the “global social crisis” which has closed down this last and greatest wave of gentrification. Now, he said, there is the political possibility of changing the rules of the game, to forward tenant and neighborhood control of city housing resources. He too warned that state repression is likely, given the example of 1930s activist movements that led to public housing. Frank Morales spoke, pastor of the St. Marks Church. For him, squatting is “putting flesh on the bones of an abstract right” to be housed. He briefly recounted his work squatting in the Bronx, beginning with the St. Ann’s Avenue garden, described by Jonathan Kozol in his book “Amazing Grace.” His views on the agenda of capital, “spatial deconcentration,” were formed through contact by murdered housing activist Yolanda Ward. Frank ended by expressing the hope that this panel might issue a call for a large-scale occupation movement in New York City. Finally, Peter Marcuse asked what happens after a squat? What can happen, and what ought to happen, and what needs to happen so that what ought to happen can. He recalled the policies of NYC’s last progressive mayor, John Lindsay, who set up the Division of Alternative Management in the city housing department. In the absence of such policies, the cycle will continue as it has after this interruption. “The next generation of gentrifiers are buying up houses now,” he said. Frank Morales is a forceful speaker; here he is in a KPFA interview in March. The "House Magic: Bureau of Foreign Correspondence" project begun at ABC No Rio has become a research component of the "University of Trash" at the Sculpture Center, in Queens NY. HM:BGC will participate in UofT events; the schedule is here. This Saturday (5/16) from 4-7pm, the Baltimore group behind the City from Below conference will present. They will discuss Participation Park, an ongoing public art project and activist initiative based on converting a vacant lot in east Baltimore into an urban farm, social space, community kitchen, radical planning studio, free store, and adventure playground. Then Monday (5/18) 7:30pm at Brecht Forum, Max Rameau of the Florida Take Back the Land group will talk. 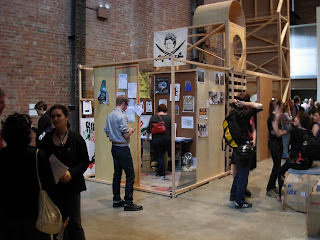 next venue for the boxed-up "HM:BFC" for the summer is at "University of Trash."